Ive written another GreaseMonkey script for the FireFox web browser, before installing the script you need to have installed greasemonkey. The script is called "Flickr Shades". It basically changes the colours of the flickr.com website, to a black background and white text, Though you can easily edit the script to use whatever colours you like for the background, links and text. 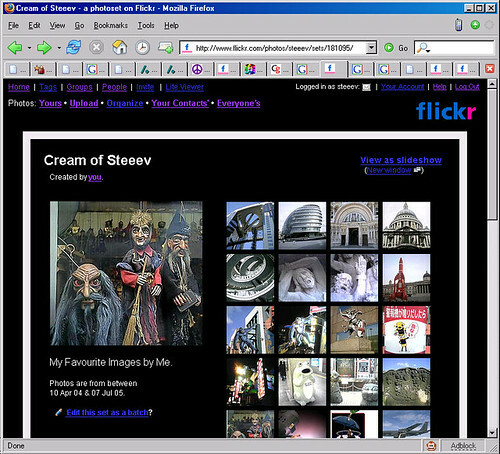 Note: You can disable or re-enable the script, by right clicking the monkey icon in the bottom right corner of the browser then ticking or unticking "flickr shades". If anyones got some better colour schemes for the links and text etc please let me know. When ive collected enough colour schemes, i might add in an options screen that will let you switch between them. Cheers. Update 25-Sep-2009 Tweaked various things (fixed for galleries + new flickr logo) Also added an onscreen link to open the colour scheme editor. Clicking the "?" 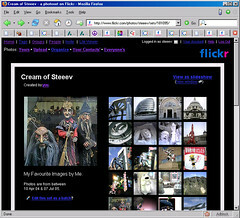 link next to the "Flickr Tools" link in the top nav menu will now also open the colour scheme editor. Update 22-Oct-2009 The latest code change at flickr meant flickr shades was blocking images on photo pages, this release is a quick fix for that problem, though now the notes are also blocked. i couldnt figure out how to unblock the notes, so if anyone can have a look at the code and help out, that would be great, cheers. Script has not yet been updated for the new photo page. Donations gladly accepted! :) Though this script is being given away for free, it is not free for me to develop it, many, many hours have been spent programming, testing and supporting it. If you appreciate my work, and would like to thank me, and also support future development and maintenence, please consider making a donation, big or small, every little helps. My paypal link is available on my website and also on my profile page.